might it be or recent usage? were cleaning their guns and one lad had not unloaded, very tragic. Delighted you liked that Medals site Sinead. I used to look into it a lot when I was starting research on WW1. That was where I first found mention of my Gt Uncle Edward having been killed in Belgium. I think it is some local person who set it up. It must have taken years of research as most of it was up before there was any free access to genealogical info. Painstaking library research. Like you I have found many graves and history listed. It is poignant when you know the back story to the people mentioned. You have a marvellous memory. Good information on that Irish Medals site. One thing intrigues me. Many (not all) WW1/WW2 participants appear to have died in action. How come they are buried in Deansgrange. Was it not the custom for casualties to be buried where they fell? Or did families have the option of repatriating their remains? 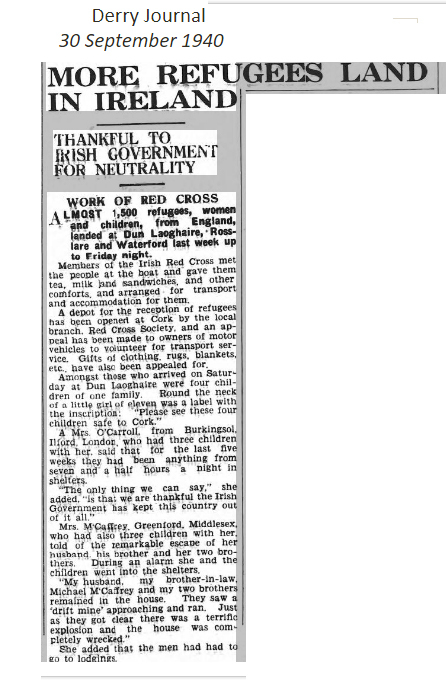 Or might they have been evacuated to Ireland as injured and later died here? I notice one case in particular. Died in 1945, but death not registered here. Interesting Micheál. I never thought to ask those questions! It could have been something to do with family having enough money to repatriate the body because I remember as a child going around the graveyard and all the wealthier folk who died during the wars were buried there. Oh, I hope some of our experts reply to this one. Interesting question Micheál, surely some would been repatriated to the Royal Hospital Kilmainham or the Hospital at Leopardstown to recover from their injuries, some may have survived for some time after, it would be nice to know the history behind each unfortunate victim. Repatriating injured would account for many. Also, I asked someone else who confirmed that families of fallen men had the option of repatriating their remains (when it was practical to do so) but at their own expense. So obviously, this option was open only to those with the means to organise it. costs. The Branch in Dun Laoghaire was very big. I was in Deansgrange cemetery recently and was taken aback when I saw a funeral cortage arrive at the gates and was led to the burial plot (which was 3/4 way up the cemetery )by a guy on a noisy dumper it was aufal to see the hearse crawl along behind this what away to be brought to your final resting place,surely one of the workers could have walked the route I think it was most disrespectful the only other thing I could think of was that the deceased was a construction worker and requested this but have my doubts. Never saw anything like that!! I know now that they don't dig the graves by hand but with a little digger but, they usually have the place set out nicely by the time the hearse arrives. Let us hope the deceased had requested that!! The daffodils are out in full splendour in the cemetery. Well done all the staff. Rocker wrote: The daffodils are out in full splendour in the cemetery. Well done all the staff. They're supposed to be pushing up DAISIES! Another funeral "development" I witnessed last week. The usual cortège - hearse, mourning car and so fourth. But something new - black flags fluttering on each of the undertakers vehicles - mounted just like team flags but black. A few years ago the older members on the site might remember that we met up with Jamie Moran to have a private tour of the graveyard. It was a wet day and we retired to the tea rooms to chat. I purchased the wonderful "Dean's Grange Cemetery, stories from beyond the grave" book written by Jamie Moran and read bits and pieces of it. A big clean up happened the other day and I found the book again. I am now reading it page by page and it is fascinating. I am going to take it with me the next time I go to the cemetery and look up the various graves. A lot of the poorer people in the Boro couldn't afford headstones and I am delighted to hear that as part of the sinking of the Leinster hundred years celebrations the Council are to erect a headstone on the grave of William Maher (stoker) Hero of the Leinster Disaster. William saved at least three people on that fateful day and was awarded a silver medal and certificate for bravery from the Royal Humane Society in 1919. He lived at 52 Desmond Avenue until his death in 1953. That tour was great. Wonder who Jamie's next book will be published. Any ideas? Rocker wrote: A few years ago the older members on the site might remember that we met up with Jamie Moran to have a private tour of the graveyard. It was a wet day and we retired to the tea rooms to chat. I purchased the wonderful "Dean's Grange Cemetery, stories from beyond the grave" book written by Jamie Moran and read bits and pieces of it. A big clean up happened the other day and I found the book again. I am now reading it page by page and it is fascinating. I am going to take it with me the next time I go to the cemetery and look up the various graves. Don't forget the tour of the graves of 11 of those who perished on the MV Leinster and the unveiling of the headstone to William Maher will take place tomorrow Sunday 7th October at 2p.m. at Deansgrange Cemetery. I was up in deansgrange cemetery on Sunday for mothers day, I see they are starting to erect a columbrium wall at turnstile exit. I saw that in the budget for the Council. Must go over to the graveyard and have a look. at long last a photo of the erected headstone. Still not getting the picture posting right can't post up straight!! anyway you get the picture! !